The Law Offices of Jeffrey L. Victor, P.C. 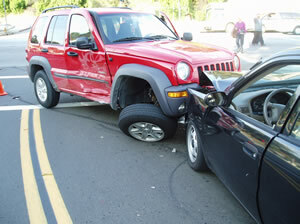 has been representing drivers and passengers involved in motor vehicle accidents . We have filed claims against negligent drivers and their employers, if on the accident occurred while they were on the job and their insurance companies . We have experience handling claims that fall under the Federal Torts Claim Act. We pursue claims for personal injuries, medical bills, future medical bills, if applicable, pain and suffering as well as lost earnings and lost ability to work, if warranted. The Law Offices of Jeffrey L. Victor, P.C. accepts motor vehicle cases throughout the State of Arizona and is available to meet and consult with you at no charge to discuss your case. Call us for an appointment at Ph: 602-749-0900 in Phoenix or 520-740-0900 in Tucson.